You may think me callous, heartless and jaded, but the fact remains: Something about the 9-year-old girl who got "married" - a story sent in by numerous tipsters - rubs me the wrong way. 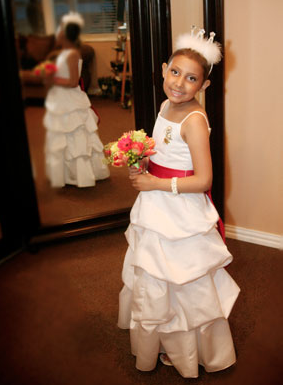 Jayla Cooper of Southlake, Texas, is dying of leukemia. It's tragic, and heartbreaking. But this story begins, "Every little girl dreams about her wedding day, complete with visions of a big beautiful white dress and, of course, the perfect man." Well, you know: Not every little girl. But Jayla dreamed of being a bride, so her parents let her "marry" her seven-year-old friend (and fellow patient) Jose Griggs. Jayla wore a white dress and a tiara and a pastor performed a cermony in which he asked her, "Will you take Jose to be your friend, forever and ever?" Jayla replied, "I will." After the couple exchanged little gold rings, they had chicken enchiladas and cake. They danced. Of course this is touching. It's a tear-jerker of a story. And I'm all for celebrating, for throwing a huge party for a child who has weeks to live. But doesn't "marriage" — the concept, the word, the institution — carry far too much weight for a nine-year-old? Even in an attempt to indulge a little girl, aren't you setting up some dangerous truths? Namely, that getting married is the most important thing a female can do in her life? And that no matter how short your life is, it's not complete unless you get hitched? And what about Jose, who is said to be on the road to recovery from his illness — the boy destined to be the world's youngest widower? I don't blame her parents for giving her what she wanted. I can't imagine the agony of knowing you're losing your child, and the urge to make her last days joyous. I guess I just wish that we lived in a world where little girls dream about being something other than a woman who promises to honor and obey.